The swimming-centric anime Free! returns most likely this summer. During a special talk event yesterday, it was revealed that a second season of the Free! anime has been greenlit. 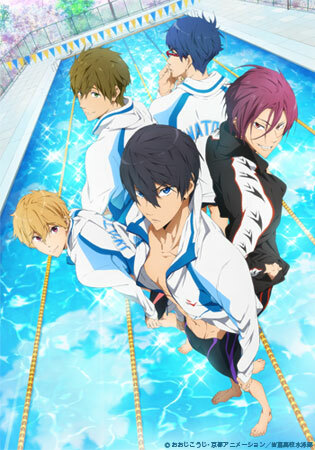 The first season ended in September with the message "See you next summer..."
The Kyoto Animation-produced anime is about a group of boys who once swam competitively, specifically about Haruka Nanase, a gifted swimmer who has little motivation about increasing his times but swims because he loves the water. After a swimming competition, his teammate Rin moves to Australia to practice swimming more seriously. Rin returns to Japan without a word and swims against Haruka, who has stopped swimming, showing Haruka how strong of a swimmer he's become. Haruka and his previous teammates Makoto and Nagisa, joined by new swimmer Rei, form the Iwatobi Swim Club and work to enter a swimming competition against Rin. The anime is part sports and part slice of life, focusing on friendship and a love for swimming. The first season premiered last July, and going by its final message, the second season is likely to air this summer. A television commercial for the project aired in March 2013 and went viral, inspiring several fanworks. Kyoto Animation later confirmed it would be working on Free!, and many of the team members who made the commercial would be working on the anime series. Some designs were tweaked by the time the project began airing as an animated series. Kyoto Animation's other series include K-ON!, Clannad, Beyond The Boundary, The Melancholy of Haruhi Suzumiya, and many more. As much fanservice of the male characters there is in Free!, Kyoto Animation captured the fluidity of swimming and greatly researched competitive swimming.